The first building to house the Hotel Keturah in McCormick was built in 1900. The two-story structure sat on this same site but burned in 1909. 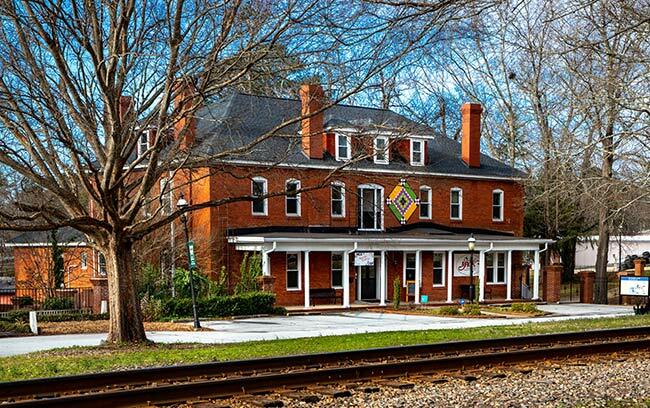 The present structure was built by 1910 and accommodated travelers and train passengers from the adjacent railroad. The hotel closed in the 1960s; it stood empty until 1982, when it was purchased and restored by Mr. O.S. Sexton. The building now houses the McCormick Arts Council, a non-profit organization providing art and cultural education to the region. We are actively seeking additional information to add to this entry. If you can help, please add information below. Thank you! The Hotel Keturah is a two-and-one-half-story brick building constructed ca. 1910 in the Colonial Revival style. The building is situated on a lot on Main Street facing the commercial row and railroad tracks. On the main façade is a one-story frame porch with Doric Tuscan columns. The main entrance features the original frame and glass double doors with sidelights and transom. Adjacent to the entrance is a projecting bay with three two-over-two sash windows. The building features a hipped roof with three prominent exterior chimneys and hipped dormers with two-over-two sash windows. The first Hotel Keturah was built by 1900 on this site. It was a two-story frame structure and stood until 1909, when it burned. The present building was constructed ca. 1910 to accommodate travelers and train passengers. Both hotels were constructed by W.J. Conner, who gave them his wife’s name. During its heyday the Keturah was managed by the Conners and was a favorite stopping point for salesmen and other travelers. The hotel remained in operation for many years until it closed in the 1960s.